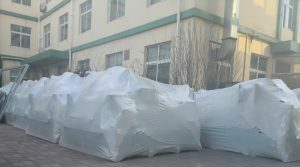 This week GN solids control shipped one batch of solids control equipments to Russia, the client inspect the equipments in our factory in Beijing before dispatch to Russia. We welcome all the clients to visit our factory before order and after order before delivery. 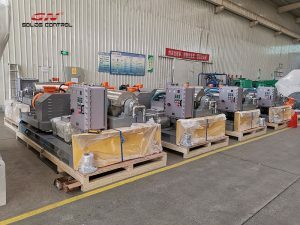 The solids control equipments they ordered including linear motion shale shaker, mud cleaner, decanter centrifuge, centrifugal degasser, this is their repeat orders since 2017, they keep repeating orders every month during the past years, and make mud tanks system locally. Sometimes they replace the old equipments from their existing rig solids control system. 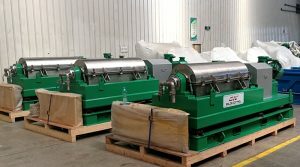 The shale shaker, mud cleaner, vacuum degasser/ centrifugal degasser, decanter centrifuge are our main products and the most popular products, we have many options for decanter centrifuges with different size from 9 inch to 30inch for different applications, for each bowl size, we have 2 models with different ratio. For 9 inch bowl size centrifuge, we have GNLW224D and GNLW224E-VFD, for 14 inch bowl centrifuge, we have GNLW363C, GNLW363-VFD, GNLW364C-VFD, for 18 inch bowl centrifuge, we have GNLW452, GNLW453C-VFD and GNLW454D-VFD , for 22 inch bowl centrifuge, we have GNLW553C-VFD, GNLW554D-VFD for option, for 30 inch bowl centrifuge, this is the max centrifuge we produced at present, we have GNLW764D-VFD centrifuge, this is mainly for tunneling project which need a huge volume of mud. 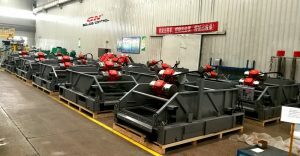 The linear motion shale shaker, we have 2 panels, 3 panels, 4 panels and double deck shale shaker for option, all the shaker screens are produced by our own workshop with our brand GN solids control, the composite material shaker screens produced by GN has been approval by many clients in the world for their oil & gas drilling rig. 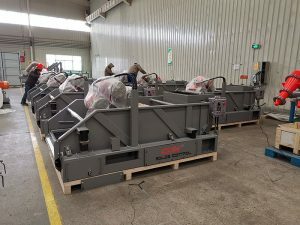 10 units of shale shakers are shipped to India drilling company this week, they also produced one set of solids control shale shaker tank ready for shipment, including 3 units of same model shale shaker, 1 unit of mud cleaner, 1 unit of vacuum degasser, 1 unit of mud gas separator, 2 units of centrifugal pumps, and necessary mud agitators, mud gun, and 1 unit of mud tank. GNZS703F-HB shale shaker is one of the best sold model shale shaker, with 3 panel composite material frame shaker screens, we produce OEM shaker screens in GN own shaker screens workshop. 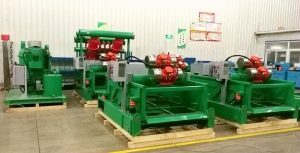 Except for the OEM shaker screens, we also produce durable composite material shaker screens for world famous brand shale shaker, like Derrick FLC 500 series, FLC 2000 series, hyperpool, D600, etc, Brandt King Cobra / Venom, VSM300, MI-SWACO Mongoose PT,MD 2/3, FSI, etc. Compared with the steel frame shaker screens, GN made composite material shaker screens with 20% larger effective screen area, the working life is much longer, the storage period is up to 5 years. The mud cleaner is the combination of desander cone, desilter cone, underflow shale shaker, the treating capacity is different by using different quantity desander cone and desilter cone. GNZJ703F-1S8N with 500gpm capacity with 1ea desander cone and 8ea desilter cone. GNZJ703F-2S12N with 1000gpm treating capacity with 2ea desander cone and 12ea desilter cone. GNZJ703F-3S16N with 1500 gpm treating capacity. 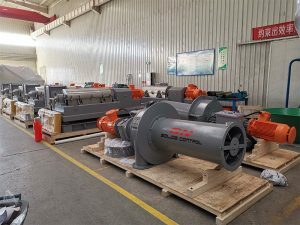 The feeding pump for mud cleaner is GN made centrifugal pump , the parts and installation dimension is 100% interchangeable with world famous brand pump. 1) The shale shaker is installed on the catching tank with offshore lifting standard, The lifting pad on the 4 corners of the catching tank is made to meet the offshore lifting standard. 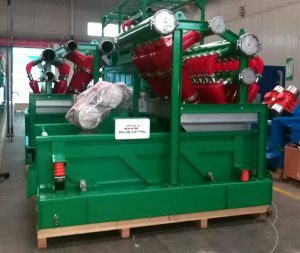 GN F version high G force drying shaker with G force up to 8.0G, the 2 nos of Italy Oil vibration motor are equipped with the shale shaker, GN own made explosion proof starter have options of ATEX, IEC EX to meet different client’s requirement. 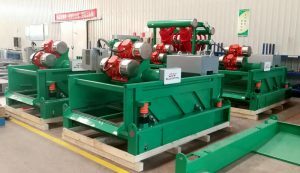 As the first phased cleaning equipment, the performance of the shale shaker is very important, a good performance shale shaker will reduce the drilling waste, recover more useful drilling fluids, reduce the coarse solids effectively from the drilling fluids, and protect the further equipments like centrifugal pump, desander cone, desilter cone, so that they will not be damaged by coarse solids and high solids content, the users can save drilling cost a lot. 2) The mud cleaner is also called 3 in 1, it is the combination of underflow flow shale shaker, desilter cone and desander cone. The desander cone is the second phase cleaning with separation cut point 45 microns, the desilter cone is the third phase cleaning with separation cut point 25 microns. 3) The shaker screens equipped with the shale shaker and mud cleaner is composite material frame shaker screens, the working life is much longer than normal steel frame shaker screens, the storage life is up to 5 years, the effective screen area is 20% larger than traditional steel frame shaker screens. 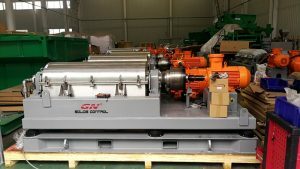 Recently GN solids control shipped one batch of the shale shaker, decanter centrifuges to Russia drilling rig. The client will produce the mud tank locally to save freight cost, import tax and save delivery time, and buy the major equipments from GN. 1) Composite material frame shaker screen for longer working life, the screen mesh over API 60 all use 3 layers wire mesh for reliable quality. 2) The screen deck bottom is made of stainless steel 304 material for better Corrosion resistant, with 3 layers costing and painting with Japan Kansai brand or US PPG brand Marine anticorrosive painting. Decanter centrifuge with 3200rpm high speed to separate the low gravity solids, after long period drilling, more and more fine solids will accumulate in the drilling fluids, which can not be separated by desilter cone and low speed decanter centrifuge, then the recovered the drilling fluids can not be reused to prepare for new drilling fluids, the user need the high speed centrifuge to reduce the solids content and separate the fine solids out. 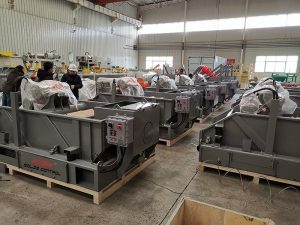 Normally they will use the low speed centrifuge before the high speed centrifuge for barite recovery, or they can use a VFD decanter centrifuge to use for both barite recovery and LGS if there is not enough space to install 2 centrifuges. 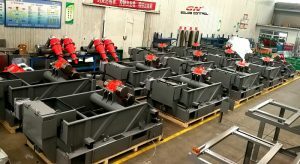 If you need major shale shaker, mud cleaner, decanter centrifuge for oil drilling rig, pls contact with GN solids control. The feeding system to the drilling waste management system is through screw conveyor, it is transferred to the open top of the vertical cuttings dryer. 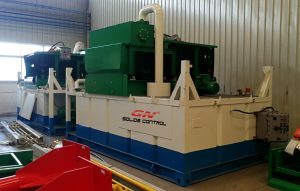 One unit of vertical cuttings dryer installed on the mud tank, the discharged solids are dropped down to a continuously working screw conveyor to ship it out from the opening of the standard 40ft container. The fluids dropped to the mud tank and the screw pump will transfer it to the VFD decanter centrifuge ,which is also installed on a short mud tank, the fluids are treated by the VFD decanter centrifuge again and the solids discharged will be also transferred out by the screw conveyor for disposal. Another screw pump is installed on the vertical cuttings dryer mud tank as the flushing pump, once the working is finished, it is necessary to flush it or when the screen basket is blocking, it is necessary to flush with the flushing pump. All the equipments are installed inside the 40ft container to keep the system warm in cold weather below minus zero degree, to prevent it from getting frozen. The 40ft container is with windows and doors for convenient operation, all the walls attached with the Insulation for better warm.